I have never thought of creating anything like this even in my dreams. Thank god one of my reader send me a mail and asked me about this. 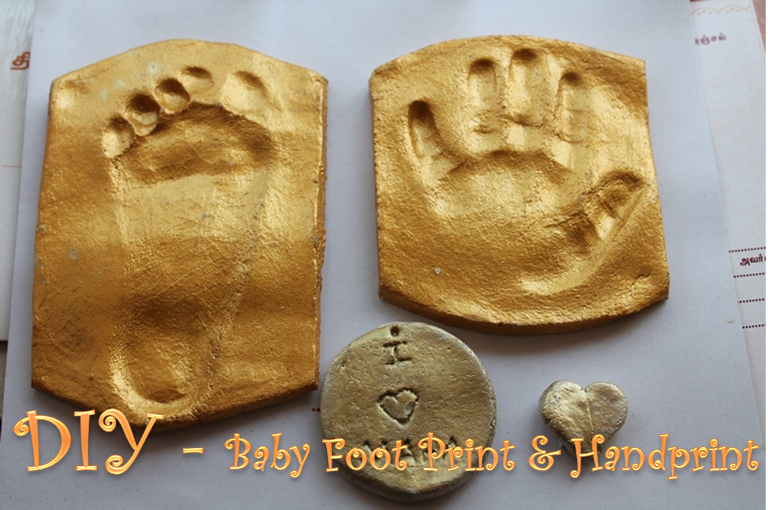 That is the time i researched in google and found this cool way for taking prints of babies foot and hands for keepsakes. I was so excited and immediately got into action. The one struggle which i went through is maha is so naughty she didn't cooperate with me properly, so i have to keep on redoing it again and again.I am sure your baby wont be that naughty, if they are just do what i did. I took this top print when she is sleeping. Peace and Perfect.. I was so excited and so happy to keep these with me till my life. The one thing which i felt so badly is, why i didn't came across this before. Because i missed those tiny hands and foot so badly..But no worries, atleast i get a chance to take them now..
Preheat oven to 100 Degree C.
Take salt and flour in a bowl. Mix well. Add warm water slowly and knead it to a firm and soft dough. Knead this dough for 5 more mins. Now divide the dough into balls. Place a ball into a bowl and flatten it, you can roll this into the shape u like using a rolling pin as well. 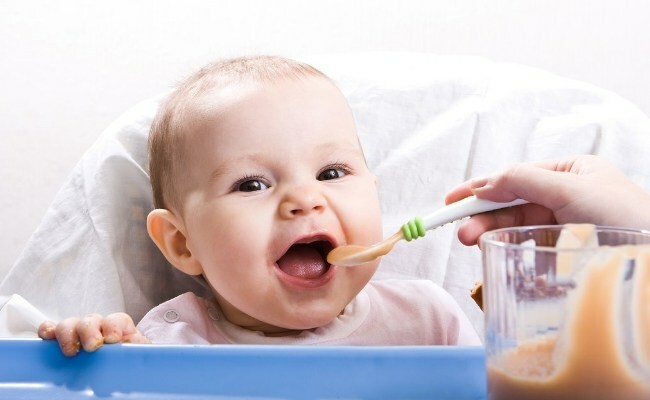 Now make your babys foot or hand impression. Place this in a foil lined baking sheet andput it in the center rack of the oven. Let it slow cook and dry out for 8 to 10 hours. Remove from oven and let it cool overnight. Now paint it using acrylic colour and let ur imagination do the thing. You can stick this in a cardboard sheet using double side stickers and frame it. 1)Before baking, you can make holes on the top of the dough so you can hang it after it is baked. 2)You can make small pendantor whatever u like using this dough. 3)You can use a marker to write the date, year, baby's name, weight on the back side of the prints using a permanent marker..
1)Dont increase the temparature of oven. If you do, then the dough will cook and get brown. They wont dry up. 2)Knead the dough really well so it is smooth. 3)Use the same cup to measure all the ingredients. 4)Dont mess with the measurement, it has to be perfect. Because it will affect the texture of the prints. I kept on kneading dough and watching maha..
You can frame this as well.. I don't see any temperature for oven. Can you pls lat us know what temperature oven should be heated. It's an awesome idea. Thank you for sharing. Hi Aarthi..is there way to make this in normal stove? I have mentioned it in the written part, it is 100 degree C.
u r amazing :). post this in yummytummy also. thanks for sharing. can u tell for how many hours we should keep this in oven. I have wriiten that in recipe. @anonymous..u have baked it at high temp. it should be very low. yes u can put parchment sheet. Hello Aarthi, how did you change the circular shape of your baked dough, since it is supposed to be rock hard? yes it has to dry out completely.it will take that long. Am really a very big fan of you and Maha. Woow....what a beautiful idea u gave us. Thanks a lot for keeping such a post like this. Am going to do this immediately. Did u bake it or airdry it? I don't have a oven. Can I microwave it or is there any other means to dry it up. hi...you can use oven 350 degree fahrenheit..cook it for 20 - 30 mins.. it came just perfect..if it puff it up little bit just pinch it with pin or knife.. actually it wont take 8 to 10 hours..tat too long process n power. i think u can air dry this, just place it under fan for several days..It would work i hope. Selvi Prakash..Did it became rock solid at that time or does it bend. Because it should be like rock solid, hence it will stay for life time. Hi aarthi.. You have got a nice blog here..need some help... I tried this few times, but every time the dough sticks to the baking parchment.. Do we need to coat the baking paper with butter or anything else..?Planning to try with foil next... Also after two to three hours of baking at 100 Celsius itself.. the dough turns brown...is it ok... But it's rock solid... Just that backside where the paper got stuck seems not all that dry.. The dough should never get dark, it should be white only. I think u are cooking it in hot temp. Reduce it even more and you dont need to spread it with anything, you can dust it with some flour. @Nandhini Yes u can use that. Aarthi..... I was much impressed about these.. I will definitely do this for my baby.... Expecting to become mom..